Back in 2007, we jumped on a small electric car company called BYD Company (OTCBB: BYDDF). We actually crushed it on that one as we took a position before Warren Buffett announced he was taking a 10% stake in the company. Of course, when we started covering the company, I had no idea Warren Buffett even knew that a Chinese company was making electric cars. The stock had a nice ride, but shortly after Uncle Warren jumped in, the stock soared and got very top heavy. It got way too hot, way too fast. We split. You see, when we first started writing about the company, it was trading for less than $3.00. By March, 2010, it was going for well over $10 a share. It didn't make sense. And sure enough, by 2012, the stock was trading below $1.70. Since then, BYD has had its ups and downs, but it has steadily climbed back, crossing $7.00 again last summer. Still, I haven't been particularly enthusiastic about the company. Sales in China have never measured up to the hype, and American auto analysts have ripped its passenger vehicles to shreds. Although when you're vying for customers in a limited market against a company like Tesla (NASDAQ: TSLA), the uphill climb is a long and treacherous one. So it came as no surprise when the company recently announced it landed a deal with Uber. If you want to go against super genius Elon Musk, you have to go big. And right now, there are few things “bigger” than Uber. Uber Inc said on Friday it struck a deal with Chinese automaker BYD Co Ltd to test a fleet of electric cars for its drivers. The test program, which kicked off a few weeks ago in Chicago and could eventually expand to other cities, is the Silicon Valley startup's first attempt to focus on an electric vehicle, said Uber spokeswoman Lauren Altmin. "We've seen interest in the program already from current and potential Chicago partners (drivers)," Altmin said. The electric car is part of Uber's program to help drivers buy or lease new or used cars. The BYD e6 vehicles are available through Green Wheels USA, a Chicago car dealership that focuses on electric and hybrid cars and also builds EV charging stations. About 25 BYD vehicles are currently being used by Uber drivers in Chicago, and the hope is to bring that number to a couple of hundred by the end of the year, according to Doug Snower, Green Wheels' president. I'm not sure how the deal went down, but this is clearly a deal that does a lot more for BYD than it does for Uber. You see, BYD has been desperate to get into the U.S. market, and the Uber deal opens the door in a big way for the Chinese electric car company. But it's only going to work if the cars appeal to U.S. consumers. I'll also be interested to see how Uber drivers respond to the deal. The Reuters article notes that Green Wheels is offering several options to drivers interested in the e6. The most popular program, however, allows an Uber driver to pay $200 a week to use an e6 for his or her driving shift. The vehicle is then returned to a Green Wheels lot, where it's charged until it's used again. I'm not an Uber driver, so I don't know if this is appealing or not. Certainly as gas prices head north again, the benefits of an all-electric vehicle increase. Although it should be noted that the EPA range on the e6 is 127 miles. In real world driving, that means it'll probably deliver about 80 to 90 miles. Not horrible, but how many miles is an Uber driver going to drive during a typical shift? I don't pretend to know the answer to this question either, but I'd be interested to know. 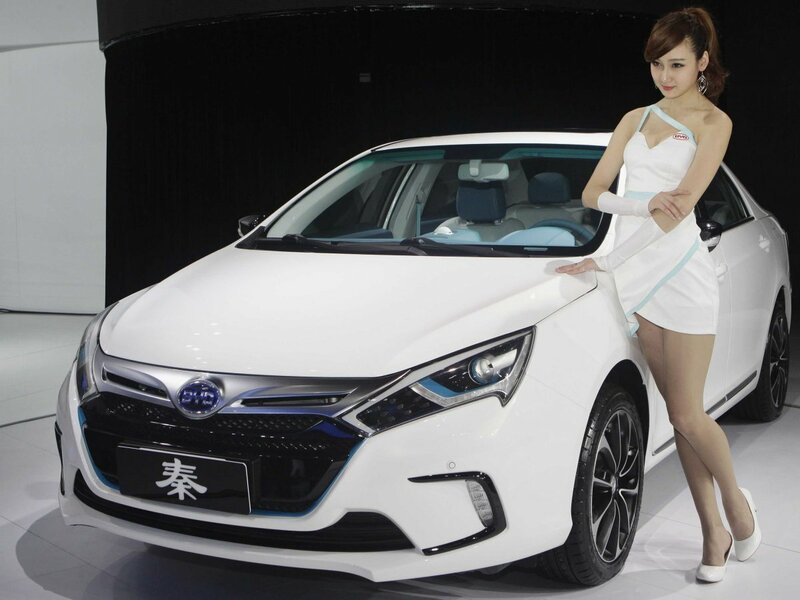 In the meantime, BYD continues to take small, but relatively important steps into the U.S. Beyond the Uber deal, the company also has close to two dozen buses running in California, and the city of Los Angeles has another 25 on order. I know the recent Uber announcement gave BYD a nice push. It'll be interesting to see if the stock can gain some more momentum this week. It is worth noting that both Credit Suisse and Goldman Sachs have given BYD a buy rating. And despite the many obstacles the company hit over the past few years, there definitely seems to be a renewed interest in the company. Particularly as China seeks to get more aggressive on controlling its air pollution problem. BYD has also generated quite a bit of good PR by claiming its also moving forward to compete with Tesla on battery production. Essentially, the company is building its own version of the Tesla Gigafactory. So is BYD back? Will Uncle Warren have the last laugh? I suppose we'll find out soon enough. But rest assured, BYD is back on the radar! Hydrogen vehicles have no shot now that electric cars have taken hold.